Our next stop on the road through the Pokemon movies is Pokemon the Movie 2000: The Power of One, known as 「幻のポケモン ルギア爆誕」 (lit. “Mirage Pokemon: Lugia’s Explosive Birth”, officially Revelation-Lugia) in Japan. This film was released a year after the first film on July 17, 1999 in Japan, coming to the American big screen a year later on July 21, 2000. After the success of the first Pokemon film featuring Mewtwo, fans worldwide anxiously awaited the next entry. 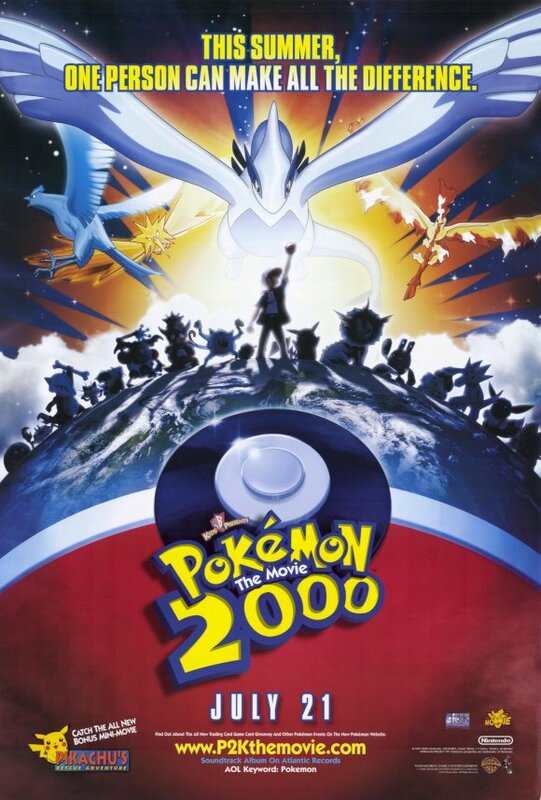 Pokemon the Movie 2000: The Power of One (hereby referred to as Revelation-Lugia) dropped. and fans eagerly lined up at the theaters. In America, viewers were also given promotional official Pokemon trading cards, among which was a special run of an “Ancient Mew” card, a direct tie-in with the movie. The cards seem to be what most people remember best, but in general, Revelation-Lugia is remembered rather fondly. Most people, especially those who have not kept up with the franchise, consider this film to be the second best Pokemon movie, right up there with Mewtwo.. Frankly, I couldn’t disagree more and I would suggest these people take off their nostalgia goggles. If you think that Revelation-Lugia is the second best Pokemon movie, you must have literally only watched this and the Mewtwo film. Out of all 16 films released thus far, I can confidently say that Revelation-Lugia was probably among the worst. It’s easily one of my least-enjoyed films in the series. The Mewtwo movie featured coherent, engaging storytelling, with a high quality and quantity of action scenes, all without needing a heavy background knowledge of Pokemon lore. Revelation-Lugia fails the high standard from the first film on practically all points. Its story is poor and simplistic. The action scenes it does have are very repetitive and not all that engaging. And, compared to the Mewtwo movie, Revelation-Lugia assumes a prior investment into the Pokemon anime, making it harder to show anyone who isn’t familiar with the series. My biggest complaint would have to be the portrayal of the titular legendary Pokemon, Lugia himself. In the Pokemon universe’s lore as well as the lore established by the movie itself, Lugia is meant to be a presiding figure over the other three Legendary Pokemon: Articuno, Zapdos, and Moltres. It sounds pretty interesting, at least. However, this movie does a terrible job of showing off Lugia’s strength and in fact makes the “proud” Pokemon look like a chump. The entire climax of the movie basically focuses on how Lugia can’t even stop the fighting between the aforementioned trio by himself despite being their superior. Lugia is even outright defeated by the trio, unable to stand up to their combined strength. If the purpose of these movies is to demonstrate the incredible power of these legendary Pokemon, Revelation-Lugia does by far the worst job at promoting its titular legendary. The preceding Mewtwo movie was ambitious. It was the first time the Pokemon franchise has tried its hand at a full length feature film, and, boy, did it do a good job. However, Revelation-Lugia suffers from the same sophomore slump that plagues fantastic first films. It happened with Iron Man 2, Jaws 2, The Matrix Reloaded, and countless other sequels to successful new movie franchises. Far from being the must-watch that fans often rate it as, I will go so far as to say this is definitely a Pokemon movie you should just skip over. Brian Terrill's 100 Film Favorites Countdown - #100: "Manos: The Hands of Fate"